Join the Hyborian Age mailing list to receive notification by email when the site is updated! Check out my blog at xoth.net/blog for more sword and sorcery material and information about the World of Xoth. December 8th, 2013: Wesley Connally has contributed a big collection of adventures based on the original Conan stories by Robert E. Howard. Enjoy! July 31st, 2012: Announcing The Citadel beyond the North Wind, a new sword and sorcery adventure set in the World of Xoth, written by yours truly! It is available both in print (from Lulu.com) and electronically as a PDF. Check out the product page for more information. April 16th, 2011: Announcing Song of the Beast-Gods, a new sword and sorcery adventure set in the World of Xoth, written by yours truly! It is available both in print (from Lulu.com) and electronically as a PDF. Check out the product page for more information. August 1st, 2010: Vincent Darlage has provided a huge collection of non-player character statistics, both general NPCs and named characters from the Conan stories. See the Characters page for an overview. November 28th, 2009: On his Classic Edition Fantasy Resources website, Jason Vey has created a pair of nice PDF booklets called the Age of Conan and Secrets of Acheron, intended for the original D&D 1974-79 brown/white box rules. See the links page for more information. December 26th, 2008: Antonio Eleuteri has contributed extensive notes on using first edition AD&D for sword and sorcery adventures. Get the PDF file from the rules section of the website. December 9th, 2008: Announcing The Spider-God's Bride and Other Tales, a massive 200-page collection of ten sword and sorcery adventures, written by yours truly! It is available both in print (from Lulu.com) and electronically as a PDF. Check out the product page for more information. 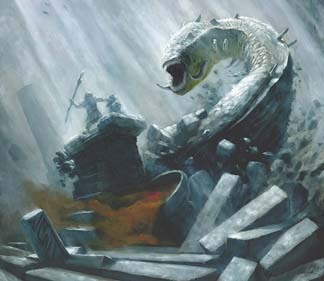 November 2nd, 2008: Majestic7 has contributed a write-up of spells converted from Call of Cthulhu to the Conan RPG. Also, I have placed a PayPal Donate button the About page for those who which to contribute a little something towards paying the server and bandwidth bills for this site. August 21st, 2008: The good folks at Dragonsfoot.org, the biggest first edition fansite on the web, have published a conversion of my The Tower of the Elephant adventure (which was written for 3E rules, before the Mongoose Conan RPG was published) in issue #13 of their fanzine, Footprints. In addition to first edition stats, this version also has new retro-style art and maps. June 2nd, 2008: Third in a series of conversion of classic 1st edition modules, here is another free adventure download, "HS4 The Lost Caverns of Acheron"! This is an homage to the original classic adventure module, "S4 The Lost Caverns of Tsojcanth", by Gary Gygax, reimagined for sword and sorcery gaming in Robert E. Howard’s Hyborian Age using Mongoose’s Conan RPG ruleset. However, since the original cavern complex is (at least in this author’s opinion) a rather mixed bag of monster-filled caverns with little internal consistency, I have re-stocked the caverns with a more appropriate menagerie. January 12th, 2008: A Happy New Hyborian Year! From the mighty pen of Vincent N. Darlage comes Hyborian Age Priests, a massive (30-page) document containing full stat blocks for dozens of different types of Hyborian Age priests, sorted by culture and level. December 22nd, 2007: Just in time for Christmas, here is "HD3 The City of the Spider-God"! This is an homage to the original classic adventure module, “D3 Vault of the Drow”, by Gary Gygax, reimagined for sword and sorcery gaming in Robert E. Howard’s Hyborian Age using Mongoose’s Conan RPG ruleset. I have turned the subterranean Vault into the valley of Yezud, changed the drow into Zamorians, and converted the priesthood of Lolth into the cult of Zath the Spider-God. I have also borrowed liberally from de Camp’s “Conan and the Spider-God” and the relevant stories from Marvel Comics, including the recent “Lord of the Spiders”. The amount of treasure (and magic) has been significantly reduced from the original. The result is a 44-page PDF module, including 20 pages of NPC stats and new monsters and magic, which should provide many hours of play. December 9th, 2007: Introducing the Savant, a variant Scholar class for the Conan RPG. This is essentially the scholar class with a few important modifications, but a separate class name was chosen so as not to confuse the two. However, they are not intended to be used side-by-side; you should choose which variant you allow in your campaigns. The PDF also contains revised spells, new spells, and revised rules for sorcery. November 13th, 2007: All right, I said I had posted all of Vincent's maps, but of course there was one very important area missing: The Black Kingdoms! Also, a map of Zamora has been added to the Dreaming West section. November 4th, 2007: The final batch of maps from Vincent N. Darlage, at least for now. I've saved the best for last; here are magnificent world maps, including versions without text and borders. As an added bonus, there is also a map of the Eastern Desert of Shem and adjacent nations. October 28th, 2007: Another batch of maps from the prolific Vincent N. Darlage, this time detailing the nations of the Dreaming West, including Aquilonia, Argos, Brythunia, Cimmeria, Corinthia, Koth, Nemedia and Zingara. October 24th, 2007: Yet more maps from Vincent N. Darlage, this time detailing Khawarizm Castle, a stronghold in the southernmost port of Turan on the western shore of the Vilayet Sea, known for its huge slave market. October 14th, 2007: After a few weeks of vacation, I'm pleased to present yet another map collection from Vincent N. Darlage, this time including cities of Shem and Stygia, as well as a sample Shemite palace. September 26th, 2007: Another map collection from Vincent N. Darlage, this time detailing typical temples of the Hyborian Age. September 18th, 2007: Maps galore! From Vincent N. Darlage comes almost a dozen excellent maps of the Blue East, based on the essay of Dale E. Rippke. September 16th, 2007: Even more material from Vincent N. Darlage; a gazetteer entry for the city of Eruk. Note that the map of Eruk was printed in Shem: Gateway to the South. September 13th, 2007: Third in a series of material from Vincent N. Darlage is a gazetteer entry for the city of Asgalun (also known as Askalon) and a map of the city. September 9th, 2007: More material from Vincent Darlage, this time a gazetteer entry for the city of Shumballa (also known as Meroê), along with several maps of the city and stats for important non-player characters. September 4th, 2007: Vincent Darlage, author of several Conan RPG books, has contributed a gazetteer entry for the city of Numalia and a corresponding map of the city. August 14th, 2007: Announcing a free adventure download, "HD2 The Shrine of the Black Ones"! This is an homage to the original classic adventure module, "D2 Shrine of the Kuo-Toa", by Gary Gygax, reimagined for sword and sorcery gaming in Robert E. Howard’s Hyborian Age using Mongoose’s Conan RPG ruleset. Many of the original's high fantasy elements have been removed or toned down, but the module should be instantly familiar to those familiar with the classic scenario, as much of the text is verbatim from Gygax's original manuscript. I have turned the subterranean Shrine into a ruined temple on a nameless island, changed the Kuo-Toa into Black Ones, and the Sea-Mother into a tentacled horror from the Mythos. September 30th, 2006: Added a review of the excellent "Conan: The Ultimate Guide to the World's Most Savage Barbarian" by DK Publishing to the reviews section. September 26th, 2006: There's a new reviews section on the site! The first review is a playtest review of "Tales of the Black Kingdoms" by Mongoose Publishing. I'll be reviewing "Conan: The Ultimate Guide to the World's Most Savage Barbarian" by DK Publishing next. April 27th, 2006: I've posted some house rules for the Conan RPG that I use in my own campaign. The variant rules include fixes for the problems with Sacrifice and Energy Drain, Terror checks, and Defensive Blast. February 8th, 2006: Jay Lawson has created a set of files for use with the online gaming software called KloogeWerks. These files make it possible to play Mongoose's Conan game with KloogeWerks, and include data files for weapons, spells, and other items. Download here! June 13th, 2005: Stephen has resurrected his Hyborian play-by-email campaign, The Tower, originally started way back in August 2002. Five new chapters brings the story up-to-date. Note that Stephen is also looking for a couple of new players to take the roles of (current) non-player characters; send him an email if you are interested. June 9th, 2005: Raven Blackwell has contributed a write-up of the deep ones for the Conan RPG. Inspired by Lovecraft's aquatic monsters, the article includes details on common deep ones, deep one warriors, priests, as well as a Hybrid template. For more critters, see the Bestiary. April 20, 2005: Ian Martin has created a PC generator for the Conan RPG. This Excel 2000 spreadsheet can be used to quickly generate PCs and NPCs. Just enter the basic choices such as race and classes, choose skills, feats, sorcery and equipment on the subsequent worksheets; and a handy 3-page character sheet will be generated for you! I've also added a write-up of a variant rule for the Defensive Blast ability of scholars, called Desperate Blast. It aims to make Defensive Blast more like it was intended to be in the rulebook. You can find it in the Rules section of the site. January 30, 2005: There is a new Neverwinter Nights community at hyborian-age.com that is in need of Conan fanatics to help them develop their world. According to the website, "We have a full world developed for your roleplaying enjoyment based on Robert E. Howard's Conan milieux. We have a complete Hyborian sub-race system encompassing the whole of the REH campaign setting, and have a full geography for you to explore as a player. The emphasis on our server is role playing, and we aspire to have a very old school dungeons and dragons pencil and paper atmosphere." Do check this site out if you are NWN and/or Conan fan! August 12, 2004: The Ancient Kingdoms: Mesopotamia adventure/sourcebook is now in print! I've written up some conversion notes for those wanting to run the adventure with the Mongoose Conan RPG rules. May 30, 2004: Do you use a battlemat and/or miniatures for your d20 game? I've made some combat counter sheets for Hyborian Age encounters, available in the Resources section. The first two sheets include the following counters: Cannibal of Darfar, Ghoul of Yanaidar, Serpentman Sorcerer of Valusia, Zamboulan Beggar, Turanian Soldier, Shemite Brigand, and Neanderthal Man. Also, check out the Sword & Sorcery Insider Summer 2004 for a preview of my upcoming mini-campaign adventure, Ancient Kingdoms: Mesopotamia, coming soon from Necromancer Games. I'll be posting some suggestions on how to place the adventure in the Hyborian Age after the book has been published. April 17, 2004: Chrysagon has made an awesome giant full-color map of Hyboria. You can download it directly from Chrysagon's site or from the maps section here at xoth.net. March 20, 2004: Today, I'm proud to present the awesome cover illustration for my upcoming adventure and sourcebook, Ancient Kingdoms: Mesopotamia, to be published by Necromancer Games. The cover is painted by Rick Sardinha, known for his work on the WotC Monster Manual, Deities & Demigods, and Call of Cthulhu. Click the image for a larger version! February 22, 2004: Mongoose's "Conan the RPG" has arrived! There is a detailed review at rpg.net. The book is expensive, with a $50 price tag, but definitely worth it for anyone considering a Hyborian campaign. It's great to finally have a common ruleset for such campaigns, reducing the need for homegrown fixes and house rules for the d20 system. The 350-page full-color book is beautifully laid out, with illustrations ranging from excellent (the Dance of the Cobras on page 210) to not-so-good (the rather amateurish sabre-tooth on page 308). Most illustrations are of the excellent variety, though, including the cover art. The magic system is great and captures the feel of dark sorcery well. In general, the book is very much in the spirit of Robert E. Howard (such great source material practically ensures a great book). On the downside, the book suffers from poor (sloppy?) editing and some rule inconsistencies. Hopefully Mongoose will release an errata sheet soon, based on input from the Conan discussion board. I will use the new ruleset for all future content on this site, eventually phasing out the references to standard D&D/d20 classes, spells, and so on. For the last year or so, I've been working on a book called Ancient Kingdoms: Mesopotamia, coming soon from Necromancer Games. It's a huge sourcebook with numerous new classes, deities, monsters and magic items, including a series of short adventures. There are plenty of references to historical Mesopotamia, but the mini-campaign has enough supernatural/fantastic elements to make it suitable for both a quasi-historical setting, as well as fantasy (with a strong swords & sorcery flavor in the style of Robert E. Howard and Clark Ashton Smith -- at least that is the atmosphere I was trying to invoke when I wrote the book). December 2, 2003: It's good to be a Conan fan these days! The preview issue (#0) of the new Dark Horse "Conan the Legend" comic is out, and if this is a measure of things to come, the future looks bright indeed. There's a sketchbook at the end with character sketches of Conan, Northerners, Kushites, Vendhyans, Aquilonians and Hyrkanians, as well as an interview with the artist, Cary Nord. I'm tempted to quote him regarding the writer, Kurt Busiek: "This is not the writer of some sissy mutant book, this is not the writer of some teen-oriented, anime-inspired team of super dorks... this is the writer of Conan. Truly, I am in the presence of greatness." Get the comic now! Also check out Dark Horse's Conan Zone for wallpapers and other downloads! As if that wasn't enough, Mongoose Publishing has set up a Conan subsite where they have posted a cover preview and interior previews of the Conan d20 RPG, due out in January 2004. There's also tantalizing hints about "The Book of Skelos", a sourcebook that expands upon magic and sorcery, scheduled for March 2004. Based on the previews, the Conan line is going to have very high production values. I've already preordered my copies -- have you... ? Last, but not least, Craig Tidwell has contributed an original Hyborian Age adventure called Slaver's Caravan. It's a low-level adventure which introduces the player characters to the depraved Zamoran society, and contains a varied mix of combat and roleplaying encounters. You can find the adventure on the Adventures page. August 22, 2003: Kenneth Bearden has compiled a very detailed chronology of Conan's early years. Check it out! There's also some preview art from Dark Horse's new Conan comic, at Conan.com. Also read an interview with the artist, Cary Nord. Among other things, he mentions being influenced by Frank Frazetta in a big way. Coupled with writer Busiek's stated commitment to the original Howard Conan, this looks very promising indeed! And by the way, check out the website of the Master artist himself, at www.frankfrazetta.com. It features a biography, gallery and museum, and more. 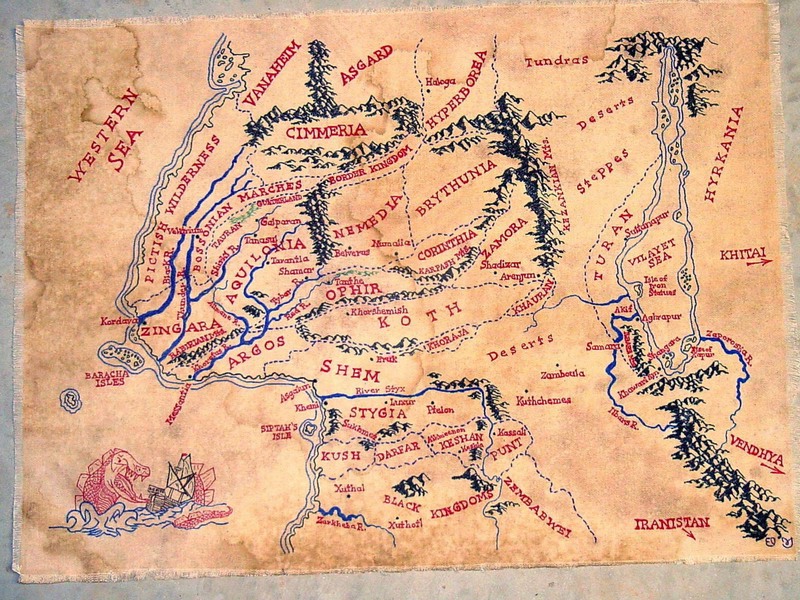 July 1, 2003: Jack Cook has contributed an image of a map of Robert E. Howard's Hyborian world which he presented to Project Pride and which was auctioned off during the 2003 Howard Days in Cross Plains, TX. Also, more details about Dark Horse's new Conan series, written by Kurt Busiek with art by Cary Nordnews, can be found here. May 28, 2003: There is a very interesting interview with Kurt Busiek at Comicon.com. Busiek is the new writer for Dark Horse's upcoming Conan comic. In a long discussion thread, Busiek promises that "it'll be a new beginning, building on the REH foundations in its own way (...) [W]e're building on the Howard Conan. Not the Marvel Conan, not the deCamp Conan, not the Jordan Conan, not the movie Conan, not the cartoon Conan. This is a fresh start." According to Dark Horse, the new Conan comic is scheduled for mid 2003. I've also added a few links to the Links page, including the Cthuugle search engine, and Eldritch Dark, a fan site dedicated to Clark Ashton Smith, one of Robert E. Howard's contemporaries. March 5, 2003: Simon has contributed a variant wizard class suitable for NPCs, called the Black Wizard. You can find it on the the Prestige Classes page (think I'll have to rename that page soon...). Also, on the Links page, I've added a link to "The Hyborian Age Appendix to the Handbook of the Marvel Universe", which contains a wealth of information about the characters of the Conan Saga that have appeared in the pages of the Marvel comics. The amount of research that has gone into this compendium is very impressive. February 2, 2003: T. Devon Sharkey has contributed a variant Hyborian Ranger class, which is based on a ranger class he developed and let players use in a Harn-based campaign. Although it's a core class, I've placed it on the Prestige Classes page. Feedback on the mechanics of the class is welcome. January 7, 2003: A Happy Hyborian New Year to you all! Rather big news these days... apparently, Mongoose Publishing has acquired the rights to publish a Conan RPG, due for release in January 2004. It's not yet clear whether it will be using d20 rules, or its own set of rules. According to the rumors, the author will be the one who wrote the Slaine RPG (which I praised back in November). That bodes well for the game, but let me just repeat the now-familiar mantra: Please stay true to the REH spirit...! I've finally decided to fully adopt the 3E cleric domain rules, abolishing the 2E concept of priest spheres. To this end, I've designed a number of new cleric domains, including Bats, Beast, Blood, Guardian, Illusion, Prophecy, Seduction, Spiders and Weather. Also suitable for Hyborian Age play are the Darkness, Fertility, Serpents and Plague domains from the Nyambe d20 sourcebook. You can find the new list of gods and granted domains here. The mechanics for simulating the use of black lotus in spellcasting have been rewritten, using drug rules from the Book of Vile Darkness. December 5, 2002: I've added a new feature to the site: The Hyborian Age Gallery. This is a list with links to all images used on the site (and some previously unreleased), except maps and adventure-specific images, with file size and date of creation. Hopefully it will prove helpful in locating images of a specific Hyborian city, race, character, god or item. Uploaded a slight revision of the Mound-dwellers of the Silver Isles (they now have tremorsense). Matthew J. Finch has contributed a very nice map of Arenjun, the notorious City of Thieves. He might do other maps later. Play-by-email update: Stephen has posted the second in a series of logs from his PBeM campaign set along the Black Coast. Read Chapter One: At the Sign of the Silver Eel here. November 11, 2002: Rakhamon has contributed some very cool conversions of NPCs (Isparana the Zamboulan thief and Ajaga the Beast-king of Abombi) and monsters (the Mound-dwellers of the Silver Isles and the Toad-thing of the Nameless Isle). Thank you, Rakhamon! Anyone wanting to flesh out Cimmerian (and other) barbarian cultures in their Hyborian campaigns should take a look at the Slaine d20 RPG book, out now from Mongoose Publishing. Besides presenting a campaign setting that's very interesting in its own right (I, for one, can't resist the quote "or throw subtlety aside and wield a flint great-axe, slaying fifty foes to the left of you and fifty to your right -- you will not think it too many"), the Slaine RPG also offers a number of crunchy bits to add to your d20 game, such as new feats (battle cry, druid slayer, ritual feast, salmon leap attack, and lots more), combat rules (naming your favorite weapon, taunting, etc. ), new core classes such as tribal warrior and witch, and so on. Well worth checking out. I also noted that the Flesh-Eater prestige class from Dragon #300 is a perfect fit for cultists of Yog, the Hyborian god of cannibalism. Filed teeth (remember the Darfari got those already! ), sneak attacks, scent ability -- that's three good reasons for your player characters to avoid the plains of Darfar...! October 14, 2002: It's been a while since the last site update, but here is an article describing the d20 rules for various lesser magical items of the Hyborian Age, such as the Fire-Dust employed by Stygian priests, the Golden Elixirs of Xuthal, and the glowing Green Fire-Stones of Xuchotl. I've also moved the list of major magical items and artifacts, such as the Cobra Crown and the Hand of Nergal, onto a separate page, artifacts and relics of the Hyborian Age. 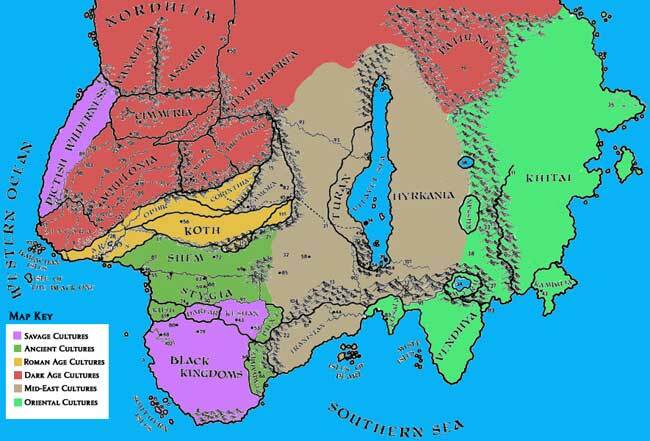 I've also uploaded a cultural map of the Hyborian Age, originally prepared by Howard (not REH!) for his Hyborian play-by-email campaign. September 4, 2002: I've made a slight update to the Tower of the Elephant adventure after Thierry Chaucheyras pointed out that Yara, per the REH story, should have access to the polymorph other spell. I've changed Yara's spell list and added to the rumor table to reflect this fact. Antonio Eleuteri has contributed some thoughts on optional rules, including an alternative view of Hyborian Age clerics. Last, but not least, I've compiled a list of Great Old Ones from the Call of Cthulhu d20 sourcebook, including the clerical domains these nasties offer their demented worshippers. August 29, 2002: The last of the gazetteer entries for now include Ophir with its gilded knights, Punt which worships a skull-faced woman, and the lands of the Sons of Shem. They are all in the "new", extended gazetteer format which includes details from pastiches and comics. Regarding the remaining nations (Border Kingdom, Kambuja, Kosala, Kusan and Uttara Kuru), I don't have enough information about them to warrant full gazetteer entries at the moment (maybe they could, with the obvious exception of the Border Kingdom, be combined into a single Kingdoms of the East entry). I've also added an illustration and extended information to the ancient empire of Acheron. Play-by-email update: I've updated the online gaming section, where Stephen has posted the first in a series of logs from his PBeM campaign set along the Black Coast. Read the prologue here. Technical note: I've had problems with slow response times from the server. Please mail to notify me if you are experiencing consistently slow response times. Play-by-email update: Two Hyborian Age pbem-campaigns are currently running, one of them even has its own web page. The DMs of these campaigns might post logs from these games here, sometime in the future. July 31, 2002: A handful of updates today; added Brythunia, Corinthia and Hyrkania to the gazetteer (I hope to complete the rest of the gazetteer entries over the next few weeks, if my "Real Life" doesn't interfere too much). Added an illustration to the Gods and Worship article. Also, Jay Hafner has some thoughts on the scale of the Thurian continent, useful for calculating distances on the Hyborian world-map. July 25, 2002: Major update today! I've finished my adventure conversion of the Tower of the Elephant story by Robert E. Howard, one of my (many!) personal favorite stories by REH. The conversion includes maps of the tower, as well as complete stats for Yara, the Wizard of the Elephant's Tower, Taurus, the Nemedian Prince of Thieves and Yag-Kosha, the elephant-being from the green planet Yag. Also added an essay on Hyborian geography by Jim Lindner to the Maps section, and added a picture and some info to the Cimmeria entry in the gazetteer. July 6, 2002: Added a write-up of Kheshatta, the City of Magicians, to the gazetteer. Also added stats for the foul ape-god of Zamboula, Hanuman, to the list of Hyborian Age gods. Minor editing of the Stygia entry in the gazetteer. July 3, 2002: I've done some minor editing of the Erlik entry (replacing one of the granted powers), as well as some minor editing on other pages. More importantly, I've added Meru to the gazetteer, as well as the Meruvian god Yama to the Gods & Demons section. June 27, 2002: Finished formatting Alex Johnson's conversion of the 1st Edition module CB1: Conan Unchained to 3E rules. Also finished the list of characters of the Conan saga from A-Z. It now counts over 400 characters (!) from the books, and I might add some selected characters from the Marvel comics. June 24, 2002: Short update today. Added Argos to the gazetteer. June 23, 2002: I'm back from vacation, and as promised here is some new stuff: Alex Johnson has converted the 1st Edition module CB2: Conan Against Darkness to 3E rules. I'll also be posting CB1: Conan Unchained as soon as I'm done with the HTML formatting and the scans. Also note that Jay Hafner has created a Yahoo! discussion group for d20 Conan, the URL is in the links section. June 7, 2002: I've had a lot of visitors over the last couple of days, after being listed at EN World. However, note that I'll be on vacation for the next two weeks starting tomorrow, so unfortunately there will be no updates to the site during this time. Watch out for some Hyborian Age adventures, as well as more gazetteer entries, when I get back! June 3, 2002: Added Aquilonia to the gazetteer. Also added more characters to the list of characters, with links to Vincent N. Darlage's Conan d20 website. June 2, 2002: I've received lots of positive feedback over the last few days, thanks everyone! Added Turan to the gazetteer. I've also set up a Hyborian Age mailing list for the discussion of Hyborian campaigns. And don't forget to try the search feature! May 29, 2002: Site launched. This is it -- two years of work finally uploaded...! Spring 2002: Continued development, converting relevant parts to 3rd Edition D&D (d20 System). Focus on character creation, magic rules and description of gods and demons. Spring, Summer 2001: Major development, with focus on gazetteer, magical items, bestiary and artwork. June-September 2000: Design and initial development of site. Spring 2000: Idea for site conceived.